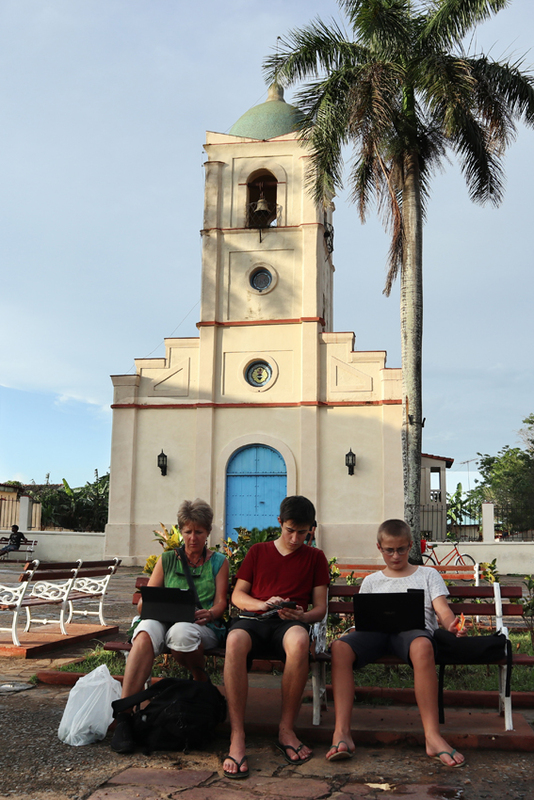 One of the first things people say, when we tell them we are taking our 14-year-old son Sam on a 9-month trip to places like Peru, Cuba and Greece, is "What an amazing experience for him! All those fabulous things he will see!" It is, I hope, an amazing experience for Sam, but I have to admit at this stage, that when he looks back on this trip, he will have seen woefully few of the wonderful sights we've encountered along the way. 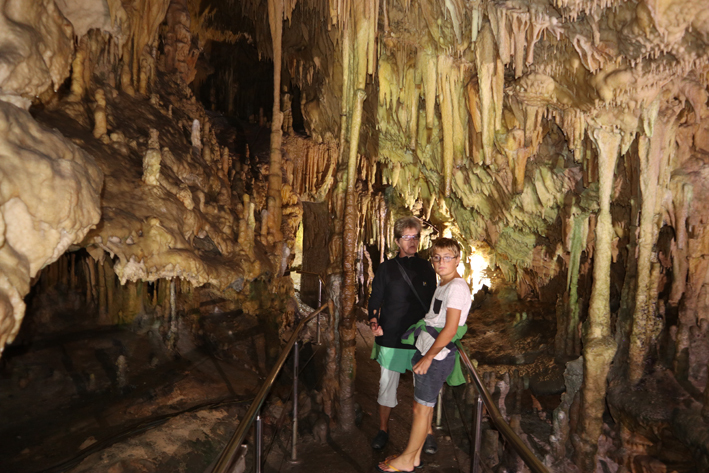 We realised early on that as a teenager with Asperger's, Sam isn't remotely interested in old stuff, particularly if you have to walk to see it. Moreover, Sam may never be interested in old stuff My brother isn't and he's 51. So we made the decision (rightly or wrongly) not to enforce sightseeing - except by Segway or pink 1950s Buick. Sam did cast a quick eye over Machu Picchu, and we stumbled across a Roman amphitheatre while out on rented bikes the other day, which we encouraged him to look at - and here's the photo to prove it. But we are all much happier when Sam stays "home" when Geoff and I either go on a walk, or visit old stuff - or both. His day is spent doing a mixture of schoolwork (he's enrolled with Te Kura, the New Zealand Correspondence School, as was), reading, and his own computer projects. For example, he recently built a Mani-inspired stone tower in Minecraft, complete with slots for pouring lava down on invaders. (Apparently you can't pour boiling oil in Minecraft, as the real Mani tower dwellers did.) He also writes the odd travel blog. 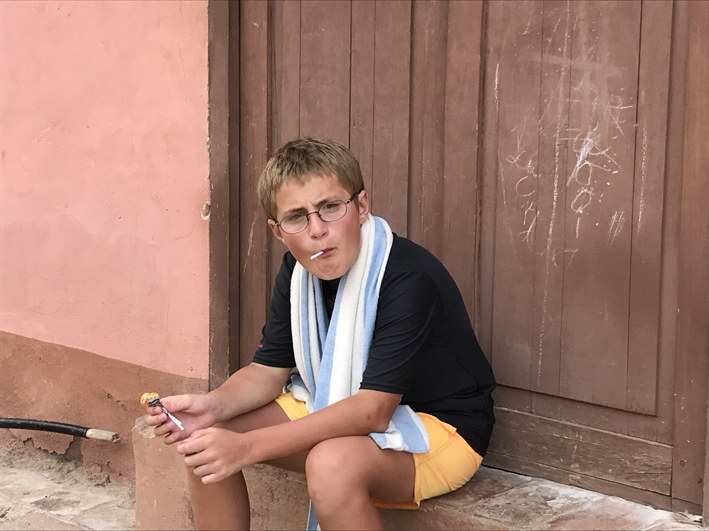 Once "school" is over and Geoff and I get back, we all get together, often for a swim and ice cream (code for going out to explore the town we are staying in, but don't tell Sam). Then there's dinner and games (normally cards or dice). And bed. Of course, sometimes we are travelling much of the day. 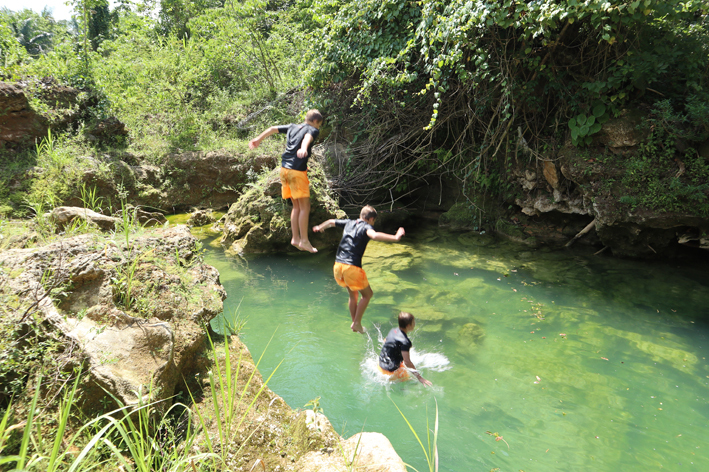 And some activities are Sam-friendly - caves, beaches, zip-lining, bikes, waterfalls, pools, horse-riding etc. But in general I reckon we've worked out quite a good system of travelling, where we choose bases to stay for a few days; places where Sam can sit on his bed and do his school work and computer stuff - and read books he's read a hundred times before. And Geoff and I can get out and explore. 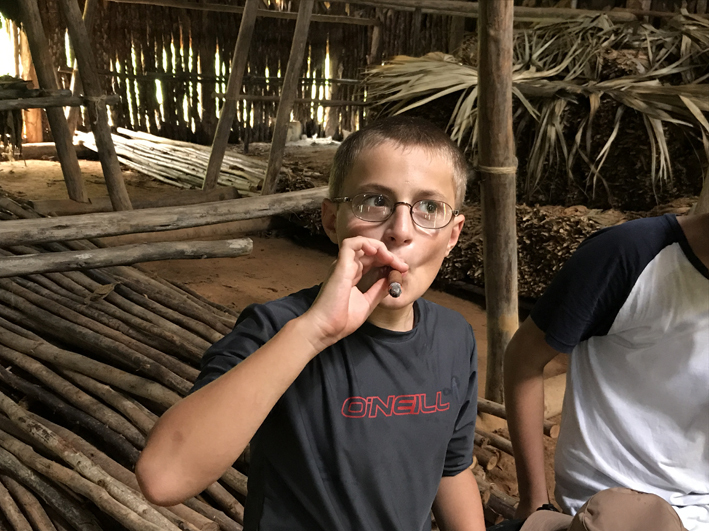 Which is a long-winded way of saying the experience of this trip for Sam won't be about understanding Incan architecture, the Cuban revolution, or the difference between Mycenaean and Classical Greek civilisations. Half the time he isn't at all sure of the name of the town we are staying in. But we reckon that doesn't matter. 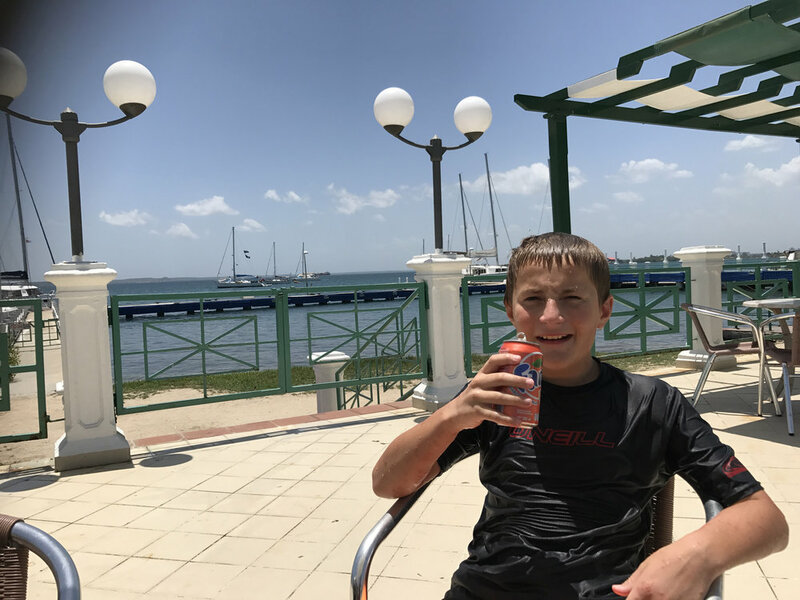 Sam will finish this trip having swum in a multitude of different places, eaten in a wide variety of establishments (and not only chips and fizzy drinks! ), stayed in rooms good and bad, and communicated with a huge variety of human beings. At Club CIenfuegos. No longer as exclusive as it used to be. I mean, look who they let in! Hopefully he will be going back with an amazing, mind-opening experience behind him - one that he'll remember for ever. Far longer than his senile parents, anyway.